consumer connections, power sales, and improve brand loyalty. 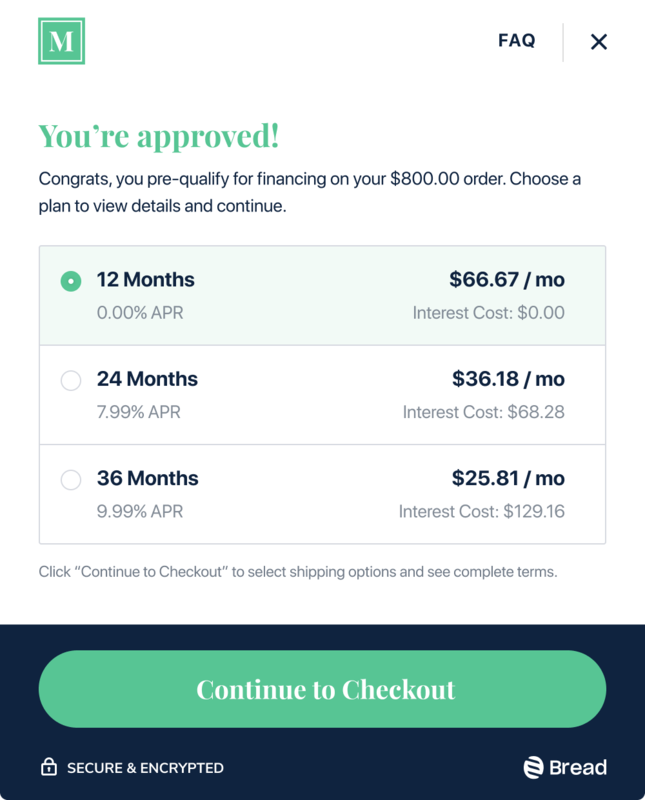 Engage customers long before they reach checkout by presenting financing options earlier in the shopping journey. Pre-qualification is quick and easy. Let your customers learn about their purchase power in seconds without ever leaving your site. We’re committed to enhancing your brand, not ours. Customize our tools to match the look and feel of your site. 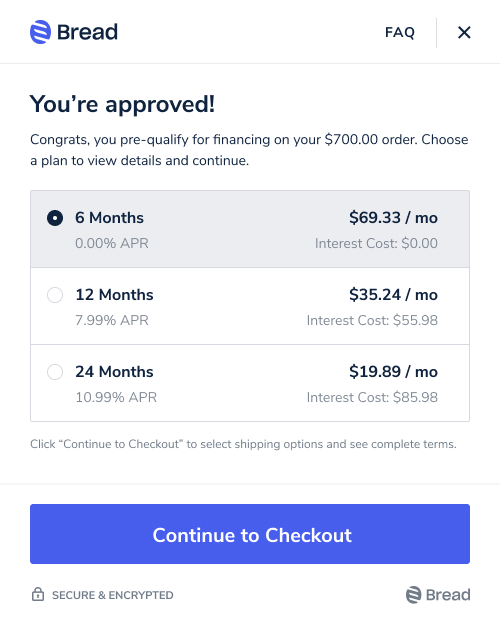 Offer terms and financing programs optimized for your products, your order values, and your customers. actionable insights and gives you all the tools to deepen customer loyalty and improve customer lifetime value. Improve your marketing reach by leveraging financing to drive conversion and improve ROI. Use Bread’s data to understand your most valuable segment and enhance customer loyalty programs to boost sales and AOV. “Since offering Bread financing, we’ve seen impressive growth in our key performance metrics every quarter, including sales, but also in average order value and transaction amounts. Not only are we acquiring more customers, but they are purchasing more than ever before." Since implementing Bread, The RTA Store has seen 8.5% incremental increase in year-over-year sales. Why do businesses choose Bread? Businesses choose Bread because our unique full-funnel, white-label approach consistently outperforms other solutions in terms of unlocking revenue and boosting AOV and customer lifetime value. How does Bread® financing work? All of Bread’s financing solutions are designed to be simple and fair, and to treat your customers with dignity. Customers make equal monthly payments until their loan is repaid. Shoppers are reminded of their due date each month, and there is no penalty for early repayment. How do I get paid and who takes the risk? With Bread, you are paid upfront in full, minus a merchant discount fee, within three (3) business days of requesting settlement. You do not take on the credit risk and fraud risk in most instances. Can we white label the Bread experience? Yes, Bread has robust white label capabilities that have been proven to drive higher conversions for our partners. 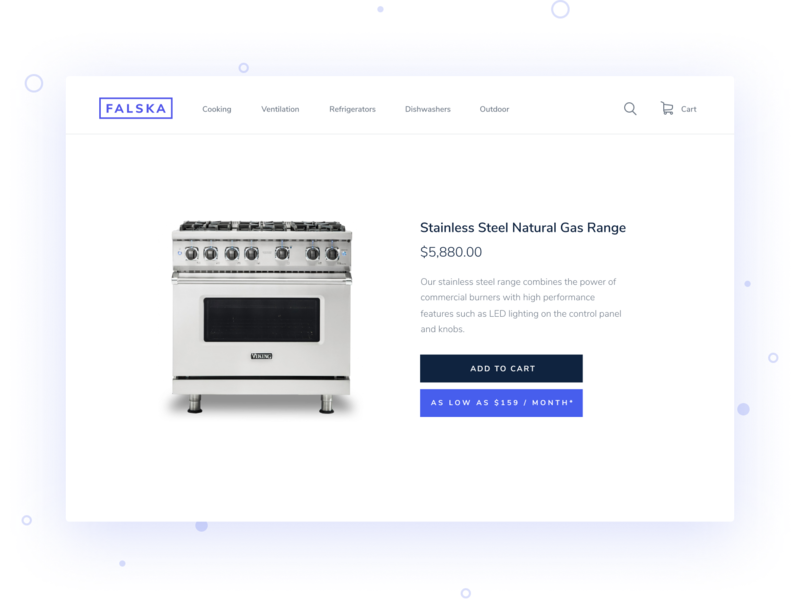 With Bread you can customize the placement, aesthetics, and branding of financing across your site, including the application experience. What kind of businesses does Bread work with? Bread partners with great brands selling direct to consumers (not to businesses) across many industries, from home goods to auto parts to fine jewelry. Bread’s solutions focus on financing durable goods rather than services. We support online, phone, and in-store sales channels with best-in-class technology and an outstanding service organization. Contact a member of our team to see how Bread can help your organization. that increase sales for retailers. how Bread can help you attract, convert, and retain more customers.